If you have a standard definition or high definition camcorder that has an internal hard drive or media card (SD, SDHC, Compact Flash, Memory Stick) we can transfer the content to DVD. We can also backup the original video files from your HD camcorder onto DVD data discs so they can be preserved for the future. 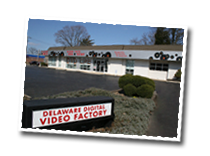 We transfer HDV tapes (Sony or Canon), Panasonic P2 or other HD files on external hard drives, SD, SDHC, Compact Flash Cards, or DVD-R / CD-R.
Standard definition tapes (VHS, Video 8, etc) should be transferred to DVD. We can design menus with custom backgrounds and navigation. Labor is billed at $95/hour. Please ask us for a quote on your project. See our duplication page for discounts on bulk quantities. Not all Blu-ray players are built the same. Many of the earlier models have playback problems. Please ask to borrow one of our test discs ($20 deposit required) to test your equipment. Else we cannot guarantee that the discs we make will play in your machine.